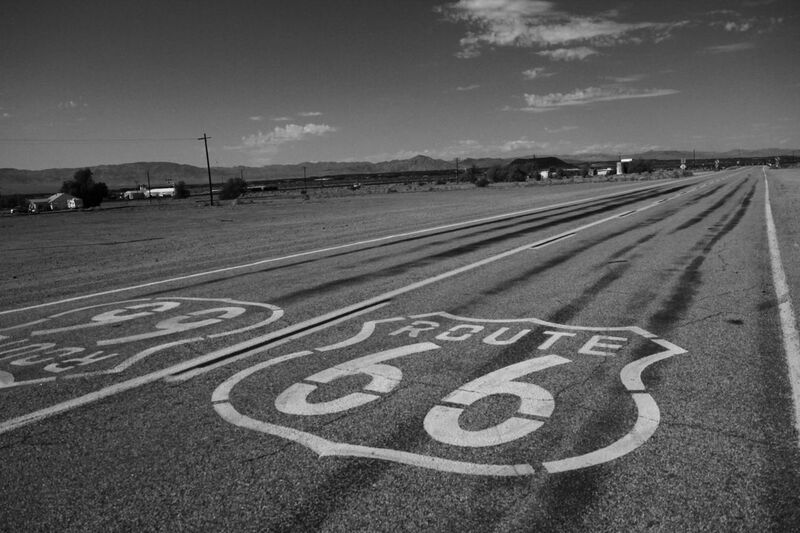 Time once again to hit the Mother Road for some fall fun and a quick check on the 66 Motor Palace in Winslow! Not a whole lot has changed along the route–which is good. For those of you on Facebook, who saw the picture Brian took of Lori taking a picture, well… here’s the picture Lori took. Pretty, eh? No 66 trip is complete without a stop in Amboy! 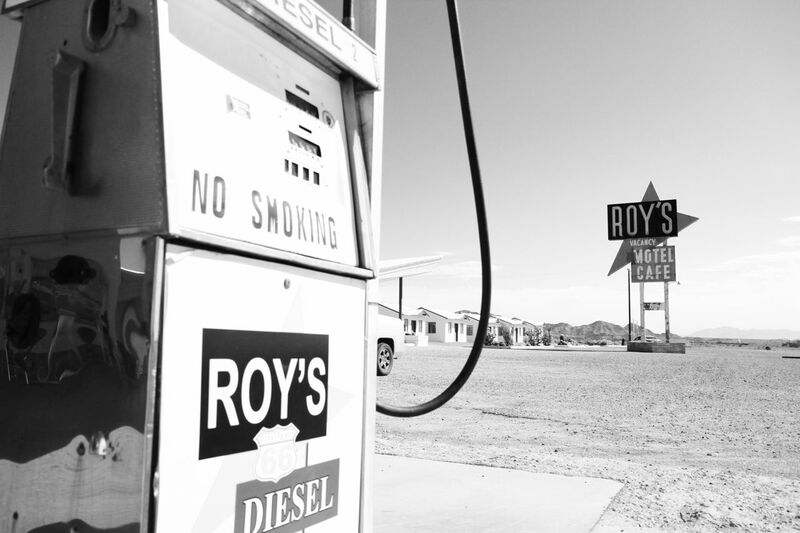 Just in case you didn’t know, Roy’s is open for gas and icy cold beverages, and is certainly one of the favorite stops along Route 66 for photo ops. We’d planned to tour the Grand Canyon Caverns just outside of Seligman (our pal from Joy Ride Vintage in Orange recommended it), but it was getting late and we still had miles to go. 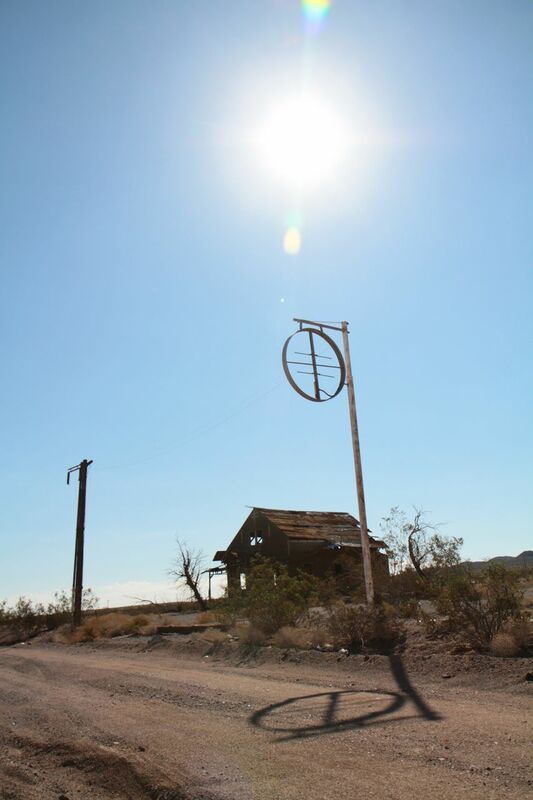 We’re definitely going to stop on our return trip so check back in a few days for pictures. Instead, we stopped in Seligman for some mighty fine tacos at the DelGadillio’s Snow Cap. 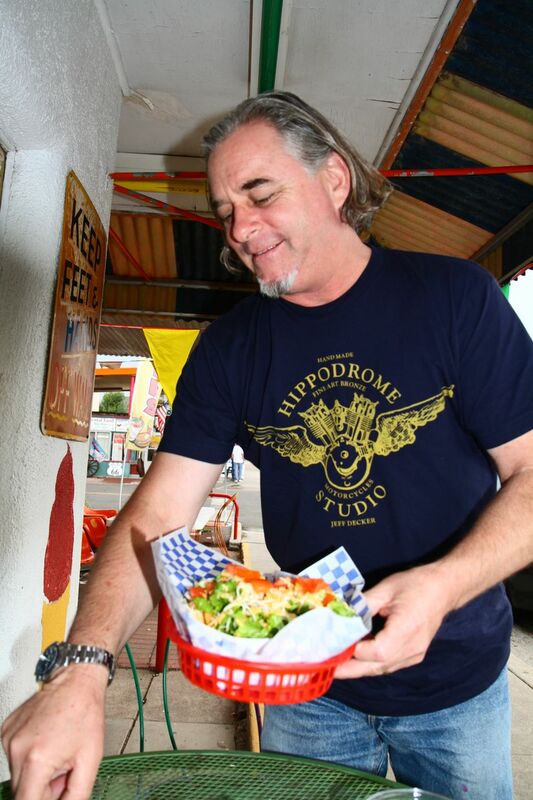 By the way, if you want one of those Jeff Decker Hippodrome T-Shirts Brian’s sportin’, drop Brian an email at 66@66motorpalace.com. Also, check out Jeff Decker’s bronze “mascots” on our webstore! His work is truly incredible, and they’re selling out fast. We dropped off some stuff at the Winslow Palace (we’ll be back later in the week), then got wind Mammy Bentley was cookin’ up a pot roast and banana puddin’ at her lake house in Pinetop! When Brian heard that, he practically did a burnout getting on the road again! When we pulled into Holbrook, Lori screamed to hit the brakes, so Brian did (good thing we just had them done before the trip). 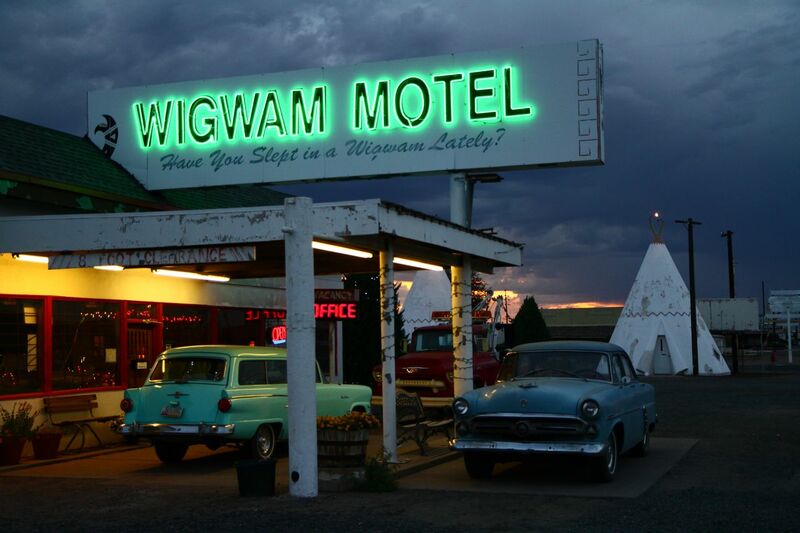 Classic cars, an ominous sky… and wigwams. Seriously. How could she pass that up? And so ends our day on the Mother Road. Lots of great sights, a delicious dinner from Lori’s mom, celebrating Paw Bentley’s birthday, and a lake view room. What could be better?